BMR is your basal metabolic rate – or how many calories your body burns just to be alive. So she would need 2175kcals a day to MAINTAIN her 140lbs for the day. If she wants to lose weight then then she needs to eat 250kcals less a day to be at a calorie deficit. Track your weight with WiFi using this scale and a smart phone. 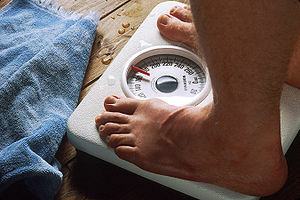 Everytime you weigh it downloads your weight and keeps track of it. There you go – I am seriously considering buying one for the studio.